The Kelch 1904 Chanticleer Egg is made of gold, green gold, red gold, pearls, rose-cut diamonds, translucent Cambridge blue, white and green enamel and silver. 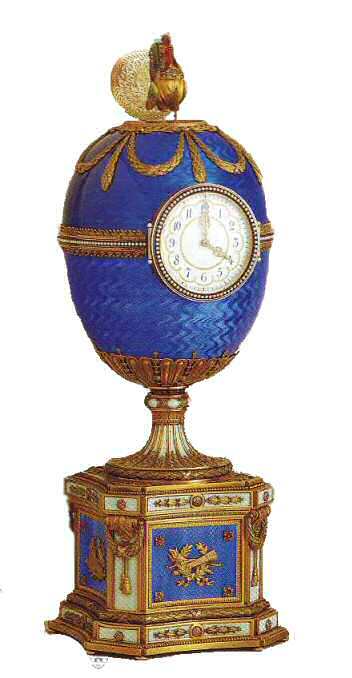 The clock, in the form of an Easter egg, is enameled translucent brilliant royal blue over a guilloche ground, and applied with green gold swags of laurel, tied with red gold ribbons and with a pearl-set girdle. The white enamel dial is painted with green and red garlands of berried foliage, the border set with seed pearls. 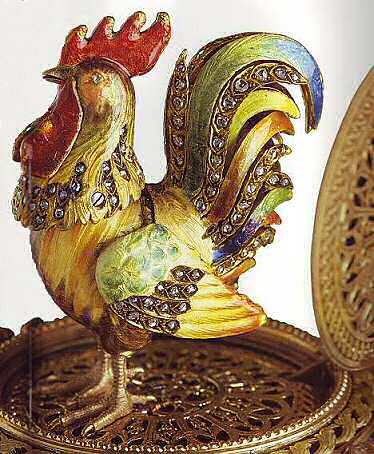 The top of the egg with a roseate pierced gold roundel is hinged to reveal the “surprise” which is an automated brightly enameled gold chanticleer profusely set with diamond. Its articulated head wings and its beak moves when the hour is crowed. On the back of the Egg, an intricately pierced round gold door provides access to the complex mechanism of the clock. The base is enameled translucent oyster over a guilloche ground between gold flutes and applied with bellflowers, the lower edge chased with a ribbon-tied laurel wreath, the square plinth with incurved sides also enameled translucent royal blue, The front is applied with a varicolored gold love trophy, one side with a cornucopia, the other side and the back with music trophies. The three are enameled translucent oyster over a guilloche ground, hung with laurel swags and with tasseled cords pendent from boldly chased acanthus leaves. The borders of the plinth are also enameled translucent oyster over a guilloche ground and applied with green gold bellflowers. Each corner of the base is raised on two compressed bun feet, marked with Cyrillic initials of workmaster, Fabergé in Cyrillic and assay mark of Yakov Lyapunov (1899-1904), 56 standard for 14 karat gold. The Chanticleer Egg is, together with the Imperial 1906 Moscow Kremlin Egg, one of Fabergé's largest Easter Eggs. It was long believed to be an Imperial Egg and was credited as such. It was also exhibited as an Imperial Egg in several major museums (Corcoran Gallery ,Washington,D.C ., 1961; Metropolitan Museum of Art, New York, 1962; Victoria and Albert Museum, London, 1977; and Naturhistorische Museum, Vienna, 199 1). In 1966 Malcolm Forbes acquired it from it A La Vieille Russie, New York, believing it to be an Imperial Egg. Doubts were first raised as to its Imperial status in 1979, when the ownership of six eggs illustrated in a 1920 photograph was attributed to a Alexander Ferdinandovich Kelch. These included several eggs which had hitherto been considered Imperial (for example, the 1900 Pine Cone Egg and the 1904 Chanticleer Egg) as well as three others bearing the initials BK of Barbara Kelch (the 1898 Hen Egg, the 1903 Bonbonnière Egg and the 1902 Rocaille Egg. The Chanticleer Egg is one of three Fabergé Easter Eggs with singing bird mechanisms, of which two also incorporate clocks. The others are the Imperial 1895 Blue Serpent Clock Egg (now in the collection of Prince Rainier III of Monaco) and the Imperial 1900 Cockerel/Cuckoo Clock Egg. Of the above Eggs, the Chanticleer Egg has by far the most sophisticated mechanism. This is the last in the Kelch series of Eggs and the last Egg from Mikhail Perkhin, who died the year before this Egg's presentation. In 1920 Chanticleer Egg, was one of the six Eggs sold by Morgan in Paris to A La Vieille Russie in Paris. In 1928 sold to an unknown buyer United States. 1949 Owned by Dr. Maurice Sandoz, Switzerland. In 1958 Collection of the late Dr. Sandoz, acquired by A La Vieille Russie, New York, from Sandoz heirs. 1960-1966 collection Lansdell K. Christie, New York. 1966 sold by A La Vieille Russie New York in private sale on behalf of Christie estate, to Forbes Magazine Collection, New York. February 2004 sold by the Forbes' family to the Vekselberg Foundation/The Link of Times-Collection, Russia. To see both Eggs together, click here!